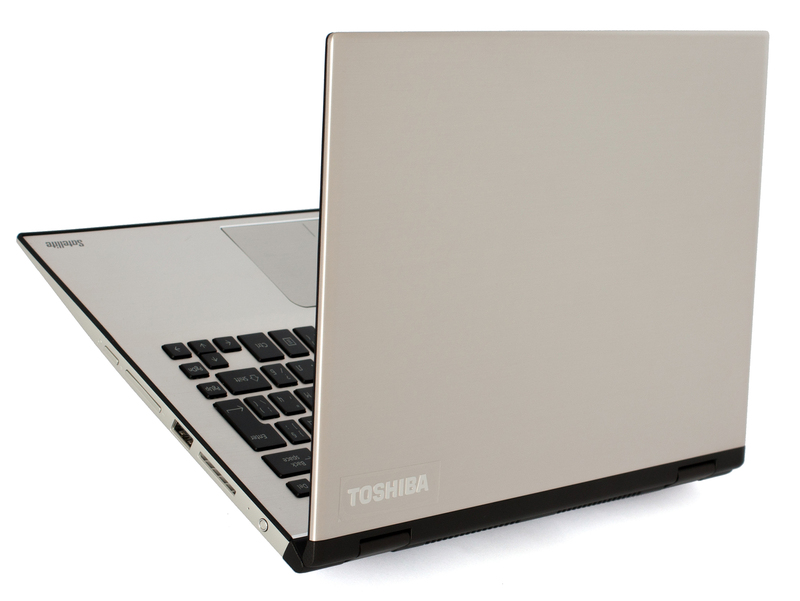 Toshiba has always emphasized on the screen quality on a number of its products and we’ve rarely complained about the image quality. But this time around, the Japanese company has taken things to a whole new level by introducing world’s first 12-inch convertible with 4K UHD screen. Some people may argue whether or not the rapid increase of the pixel density in modern screens is good or not, but a fact is a fact – Toshiba delivered. With the extra pixels, however, comes the cost of battery life. The power-hungry screen will surely take a toll on the battery life and also increases the price by a fair margin. Most people would be happy with the standard Full HD variant and take advantage of the extra hours away from the plug. But we don’t doubt that the $1 499 price for a bright UHD screen may appeal to some, yet the Full HD version sells for around $999 paired with Core i5 CPU sounds like a great bargain. Anyway, we will find out more about the UHD version and see if it’s worth the extra bucks. You will find all the available configurations at Amazon.com. Nothing interesting here to be honest – just the usual user manuals, AC adapter and charging cable. The Radius 12 boasts not only gorgeous IPS panel but also an impeccable design and excellent build quality. It’s built to precision with an excellent choice of materials without affect much the weight and size of the machine. It’s quite similar to the XPS 13 in terms of portability, even though the XPS 13 is a 13-inch laptop, but there are several key advantages of the Toshiba offering and the price tag is just one of those perks. It’s not easy to miss the brushed aluminum plate on the backside of the screen that seamlessly connects with the rubberized bezel across the hinges. The disassembly showed that the Wi-Fi antennas are hiding in the main body’s black bezel that also accommodates the main exhaust vents. As for the hinges, they feel solid and durable but are not tight enough – touching the screen produces the so-called wobbling effect. Speaking of the touch screen, the bezels appear to be quite thin, which takes away some of the size and helps you concentrate on the content. As for the bottom piece – it features only two big grills for the extra airflow as well as the openings for the stereo loudspeakers on the sides. Despite the incredibly thin profile of only 15.4 mm at its thickest point (the front is even thinner), the machine offers more than the bare minimum of ports without missing on the full-sized HDMI port, which was absent in the Dell XPS 13, for example. The left side accommodates the DC charging port, HDMI, one USB 3.0, one USB 3.1 Type-C connector and a 3.5 mm audio jack. As for the left side, it has only one USB 3.0 port and the SD card reader. Also, there is a handful of buttons too – power button with LED so that can be easily recognizable in the dark, the volume rocker and next to it a key that brings out Windows’ search box. These will prove very useful in tablet mode. Speaking of which, the edges around the main body feature silicone stripes for better grip while in tablet mode. But the so-called tent mode is a bit tricky as the lid doesn’t have the aforementioned silicone stripes and you should be careful with the surface you put the machine on. 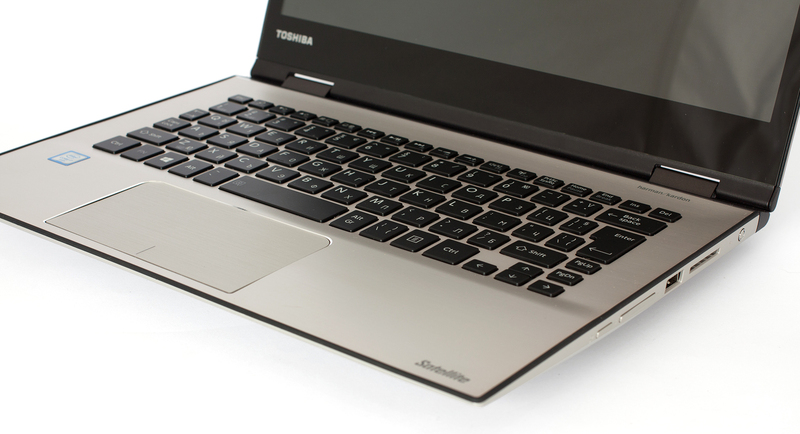 Just like most Toshiba notebooks we’ve reviewed so far, the Radius 12 adopts the same aluminum-like surface around the keyboard and the same big and metallic touchpad on the 13 and 15-inch models. It performs relatively well, but small movements sometimes remain unregistered. We were left with mixed feelings. The keyboard, on the other hand, was surprisingly comfortable for a 12.5-inch notebook. 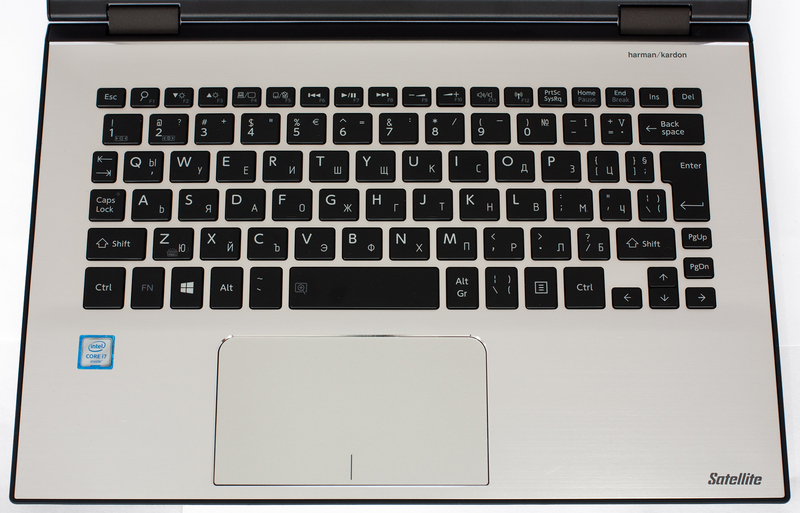 Aside from the smaller tab key and generally narrow keys, the buttons are well-spaced apart without killing the “F” row. The typing experience is good after you get to know the input device. We were also pretty happy with the key travel – it kind of reminds us of the Satellite P50-C with its flashy LED-lit keyboard that had pretty short key travel but provided solid feedback. The bottom line is that you can’t actually expect a traditional full-sized keyboard but it’s a great performer and will suit you in most situations on-the-go. 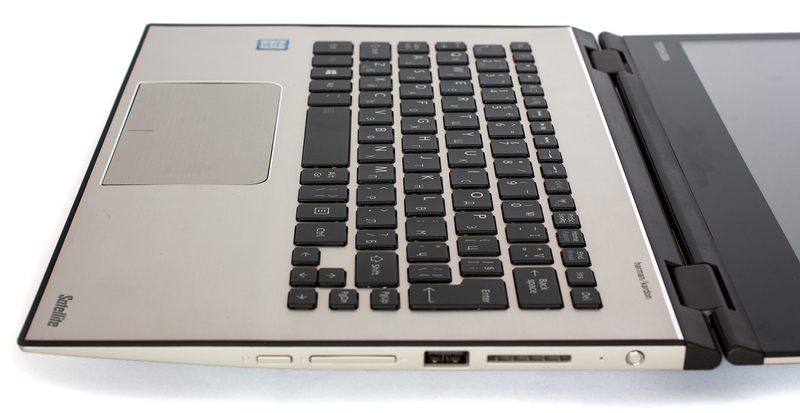 And last, but not least, the keyboard tray appeared to be really solid and the “Fn” key was within the reach of most function keys, although the function keys are assigned as default. 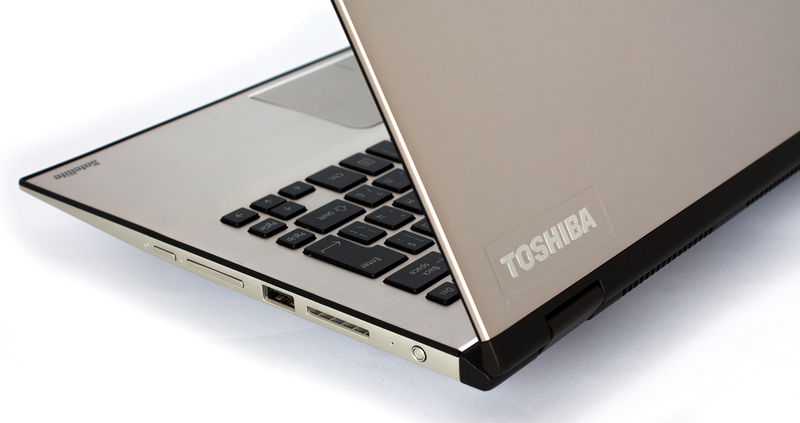 The Toshiba Satellite Radius 12 can easily fool you that you are actually working with a tablet due to its ergonomics, impeccable design and incredibly small size (15.4 mm thick profile) and weight (1.32 kg). It’s a great solution if you are constantly traveling around and also a good working station thanks to the full-sized HDMI port and two USB ports for peripherals. It also boasts solid construction that doesn’t give in even under a decent amount of pressure. We rarely say this, but it feels like it’s built with precision to last. Our complaint about the bouncy screen and erratic touchpad performance remain, nonetheless. 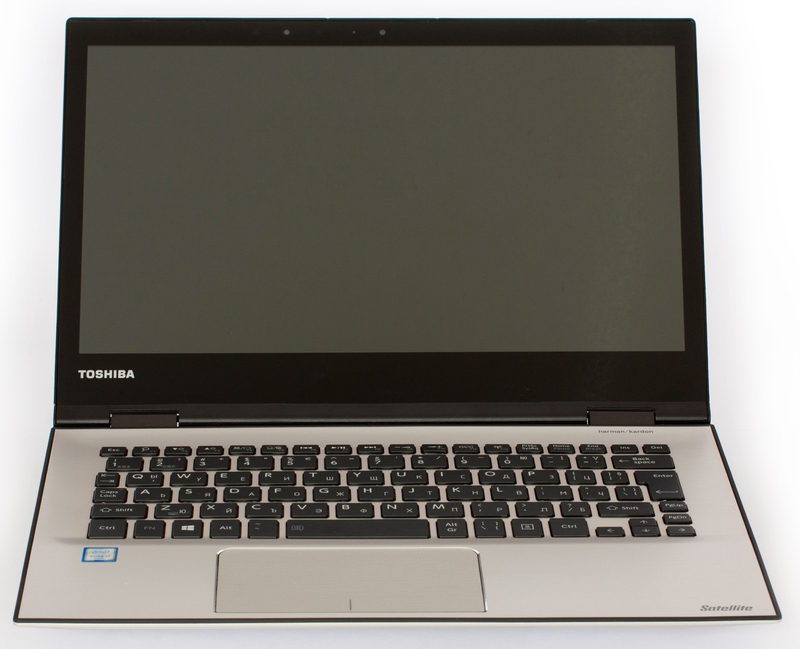 This is where the Toshiba Satellite Radius 12 shines. The panel used for the display is Sharp-made with model number LQ125D1JW33 packing an Ultra HD (3840×2160) resolution in a 12.5-inch diagonal. This means that the aspect ratio is 16:9, as always, 352 ppi pixel density, and 0.072 x 0.072 mm pixel pitch. The human eye won’t be able to distinguish the pixels from one another if viewed from a distance equal or greater than 25 cm. The IPS panel provides comfortable viewing angles from a 45-degree incline. The notebook comes with pre-installed software that allows you to choose from a set of different presets depending on your needs. The presets offer different white balance options, sRGB coverage and gamma. 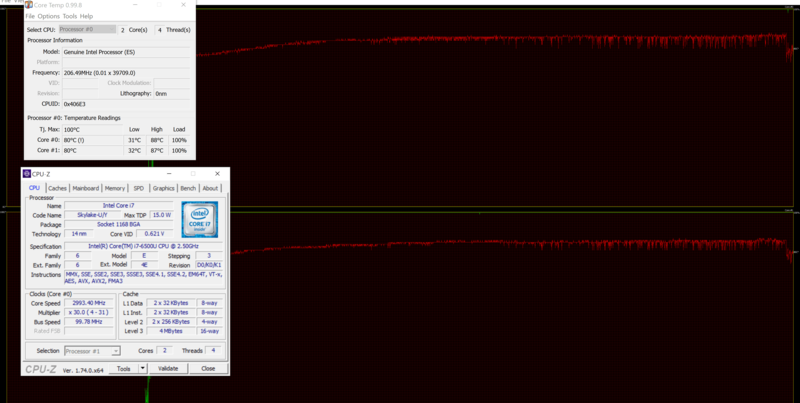 We measured 314 cd/m2 maximum brightness with only 7% deviation on the surface of the screen. The color temperature is 6690K. Both results are taken using the “Native” profile. The panel is able to reproduce 99.5% of the sRGB gamut which is a pretty impressive result. This ensures vivid and punchy colors. We also took our time and played around with some of the presets. We also ran some tests on two of the presets – Rec.709 and Adobe RGB (1998). The first image, you will see 100% and 50% saturated reference colors inside the sRGB color gamut in “Rec.709, Gamma 2.4” while the colored circles represent the results from our testing. The second image is the same but this time, we used the Adobe RGB, Gamma 2.20 profile. The native white point here is again 6500K. On the contrary, for prepress-related work, the color temperature should be approximately 5000K. This way, images appear like they are printed on a paper. There’s a tendency with the 6500K(D65) being the universal white point, but most professionals will disagree. As for the “Warm” preset, the white point is 5300K with emphasis on comfortable temperature for reading. Here’s the DeltaE 2000 for most of the profiles. Color accuracy is high even without calibration so most users won’t feel the need for further calibration and profiling. We again calibrated the display at 140 cd/m2 and 6500K color temperature using X-Rite i1DisplayPro with active “Native” profile. We tested the display using 24 commonly used sample colors like skin tones, grass, blue sky, orange etc. 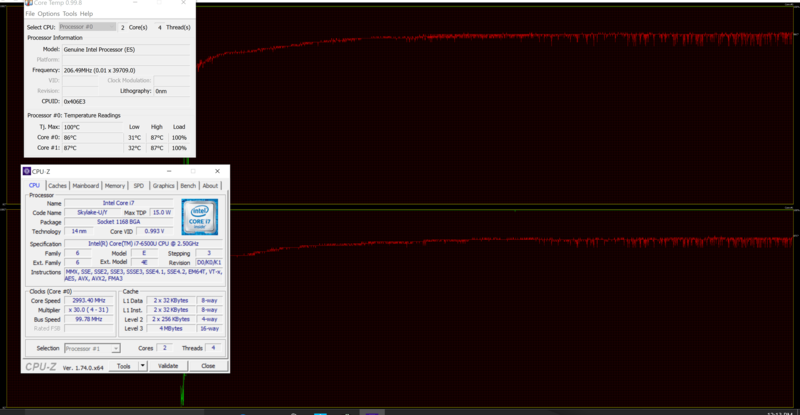 We’ve got pretty good results after calibration – DeltaE 2000 = 0.89. The contrast ratio before and after calibration is 1300:1 and 1280:1 respectively. Excellent results once again. Without ruining the perfect run on our display tests, the panel uses PWM only below 100 cd/m2 screen brightness. According to our oscilloscope, the screen flickering occurs at really low brightness levels and the emitted light is pretty high – 25 kHz. We consider the display user-friendly and will not cause any eye-fatigue if used above 48%. And most probably you will not use it under 48% unless you are in a really dark room. The Sharp panel here is a living proof that the pixel count matters, but not as much. It’s not just a pixel-packed screen with UHD resolution – it’s a quality IPS panel with high maximum brightness, tons of presets for calibrating, high contrast ratio, accurate color reproduction out of the box and almost full (99.5%) sRGB coverage. Also, the recorded screen flickering occurs only below 48% screen brightness. It’s definitely one of the best displays we’ve tested so far. 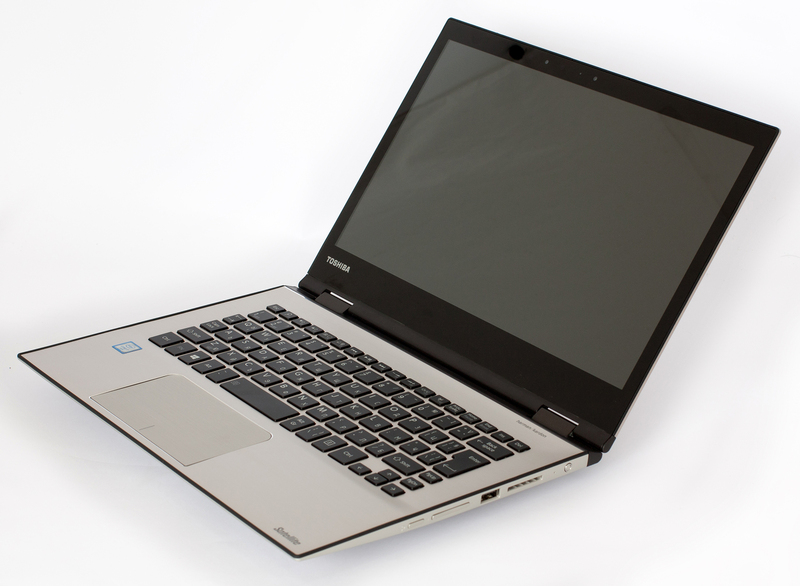 Despite the small size of the loudspeakers, the notebook offers pretty good sound quality thanks to the Harman Kardon technology. The sound quality is excellent – it’s rich, full and clear throughout all frequencies. The loudspeakers cover the +/-6 dB diapason. 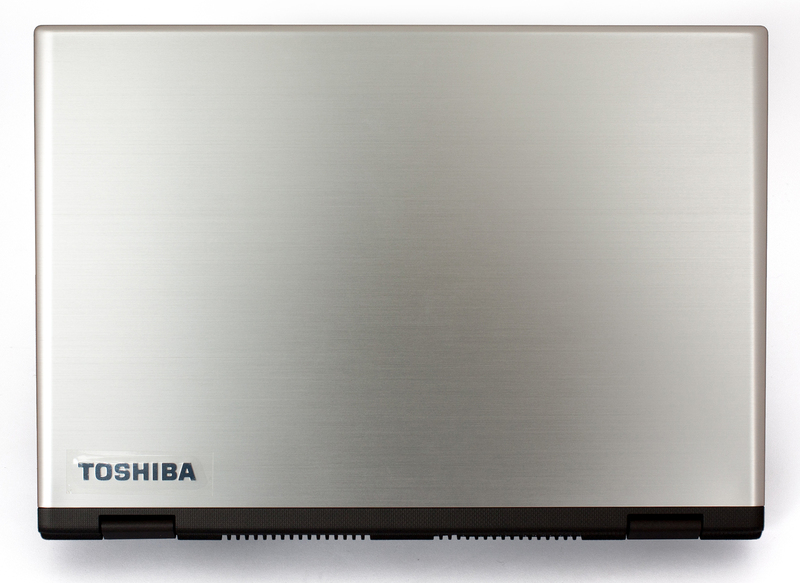 The notebook came with pre-installed Windows 10 (64-bit) but if you are willing to perform a clean install of the OS, we suggest downloading the latest drivers from Toshiba’s official website. The results we got from our tests suggest a pretty decent battery life – we actually expected less time on the browsing test. Nonetheless, it drags behind other 12 and 13-inch ultrabooks in terms battery performance and it’s clear that the 43Wh battery can’t keep up with the pixel-packed IPS touch screen. All tests include the following settings: Wi-Fi turned on, screen brightness set to 120 cd/m2 and power saver mode turned on. Actually, more than we expected, but still mediocre for its class – 322 minutes (5 hours and 22 minutes). Significantly lower result – 261 minutes (4 hours and 21 minutes). This test is run mostly for comparison and we doubt you will game on this machine, let alone away from a power source – 127 minutes (2 hours and 7 minutes). Fritz is a chess benchmark that tests the computing capabilities of the CPU with various chess moves. The Intel Core i7-6500U reached 5.984 million moves per second. By comparison, one of the most powerful PCs, Deep(er) Blue, was able to squeeze out 200 million moves per second. In 1997 Deep(er) Blue even beat the famous Garry Kasparov with 3.5 to 2.5. This two-staged test isn’t meant to represent a real-life situation since it’s quite unlikely that the general user would reach 100% CPU and GPU load for such long periods of time. However, this is a good way to assess the cooling capabilities of the system and see how the machine handles higher loads and temperatures. We start off with 100% CPU load for about an hour. The silicon reached relatively high temperatures – 87 °C, but without any signs of throttling. Just for the record, the CPU’s Turbo Boost frequencies are 3.1 GHz for one active core and 3.0 GHz for two active cores. You can see the red line representing the temperatures and the green one that stands for CPU load. After one hour, we turned on the GPU stress test as well. Temperatures didn’t rose, but the frequency of the chip started dropping in order to make room for the iGPU. Stil, most of the time the CPU was running again at 3.0 GHz, which is an excellent result. You can see on the temperature map below that in some areas, the ultrabook gets pretty warm but keep in mind that these temperatures are normal given the nature and the duration of the test. And this is an ultrabook after all. Also, the ultrabook stands as a great alternative to other portable devices on the market with several key selling points. 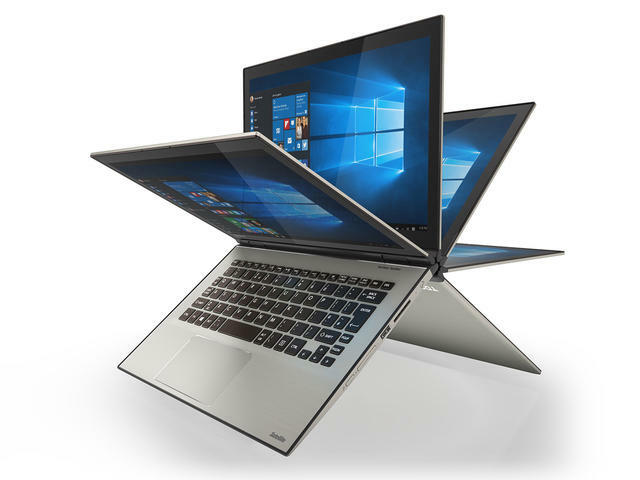 For example, compared to the Dell XPS 13, the notebook offers better image quality, the same hardware running the show and with considerably lower price (for most regions that is). However, the battery life is somehow underwhelming, yet browsing runtimes were slightly higher than expected. Heat management and noise levels are also good. 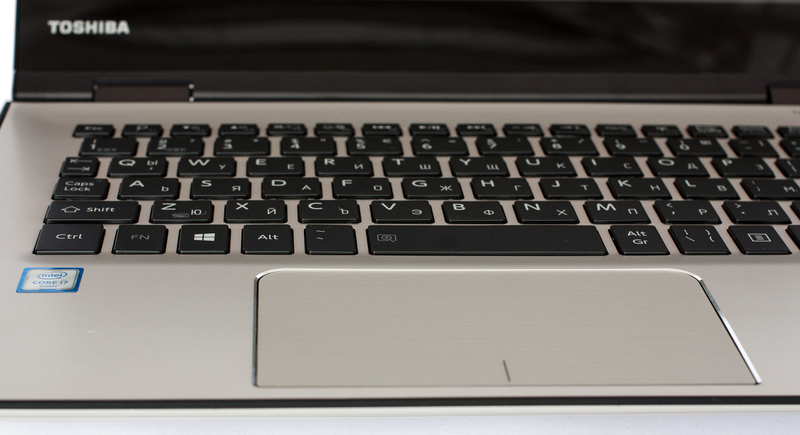 And finally, for an ultrabook like this, we are pretty impressed by the variety of ports that it offers. 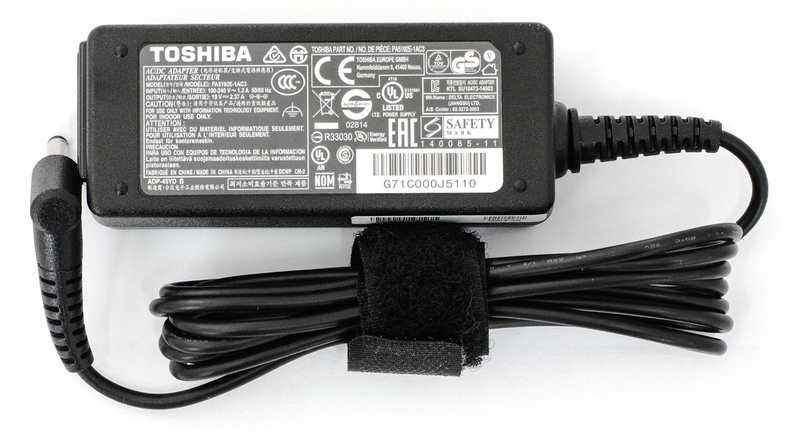 It can easily rest on the desk connected to an external monitor and a few USB ports for peripherals and that’s something we are used to by the Japanese company. At the end of the day, you receive a capable device with tons of features, little setbacks at a relatively decent price, well at least compared to other luxurious offerings at the moment. 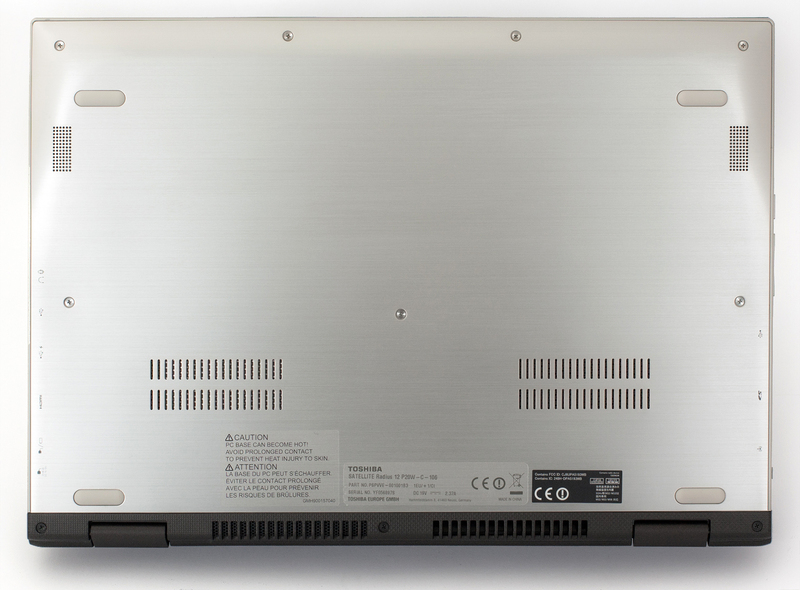 Witch one is better, this one of the hp spectre x360 13-4110? On the m2 comparability page, Radius 12 was listed as supporting only 2280 m key ssd, but here on specs, it says PCIe SSD. I want to replace mine with a 1tb nvme ssd, it that workable?